Viva la dolce! : SPRING DRESSES! I'm happy to introduce to you a new, contributing writer to Viva la Dolce - my niece, Stephanie! She is an aspiring journalist, and while young, has already been published in a local magazine in the Greater Toronto Area. Now you can look forward to her work here on the blog! The love of writing definitely runs in our family: my paternal grandmother was known for her beautiful penmanship and talented writing skills; I, myself, have been recognized from a young age for my poetry, song, short-story and essay writing talents, and continue to write here on the blog, as well as in local magazines; and now my niece is following in our foot steps! Check out some of her fashion advice below, as she lets us know about dress trends for Spring! The birds are chirping, the sun is shining and spring has (finally!) officially sprung! With summer just around the corner, all we need to accompany the changing seasons are some new additions to our wardrobe! This year, there are many new and exciting trends that have hit the runway and the streets; like off-the-shoulder sleeves, floral print, slip dresses and the extremely popular "generation z yellow," that everyone should try out! 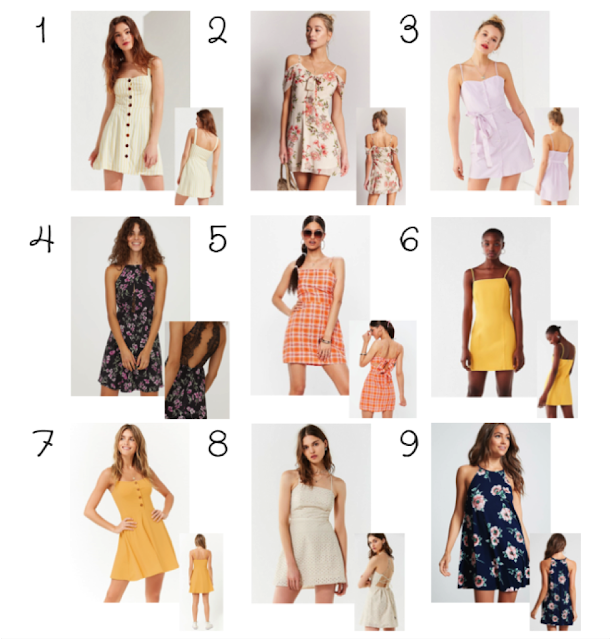 Below are nine cute and trendy dresses that are perfect for spring!